This is a strange omission, even by Microsoft standards, considering that they have gone to the trouble of programming several esoteric mathematical functions such as the Bessel Function, but they haven’t provided the most basic support for operations on vectors. It’s easily fixed with some User Defined Functions (UDFs) of course, so that is what this post examines. The VectorFunc.xlsb spreadsheet includes full open source code for all the functions. Many of the UDFs in this spreadsheet return results as an array function. Refer to Using Array Formulas if you are not familiar with their use. 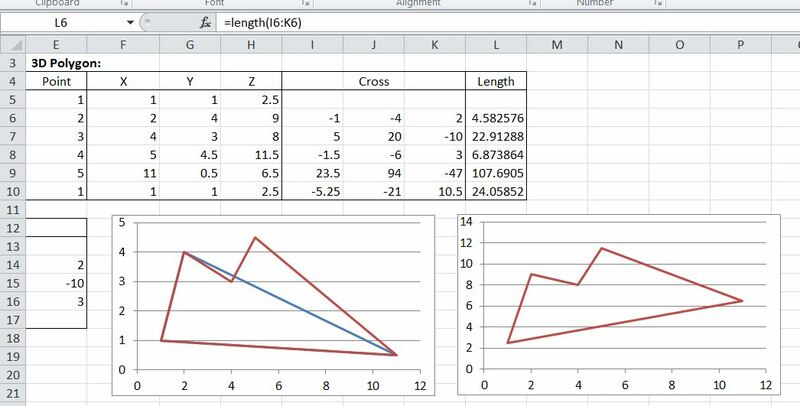 In the following post I will have a closer look at the application of vector methods to calculating areas and other geometric section properties. In the course of researching this post I came across the Softsurfer site, which contains detailed descriptions of coordinate geometry related algorithms, including c++ code. Several of their vector related functions have been converted to VBA and are included in the download spreadsheet. If Vect1 has 2 dimensions, check the orientation, assuming “vertical” if it has two or more rows, or “horizontal” if it has 1 row. Redimension the output array, Vect2, as a base 1, 1D array. Note that the function returns the size of the array Vect2, but because Vect2 was passed as an empty double array “by reference”, its contents are available to the calling procedure. The GetVect function is used in the Dot and Cross functions, which in turn call Dot2, Dot3, Cross2 or Cross3 as appropriate. 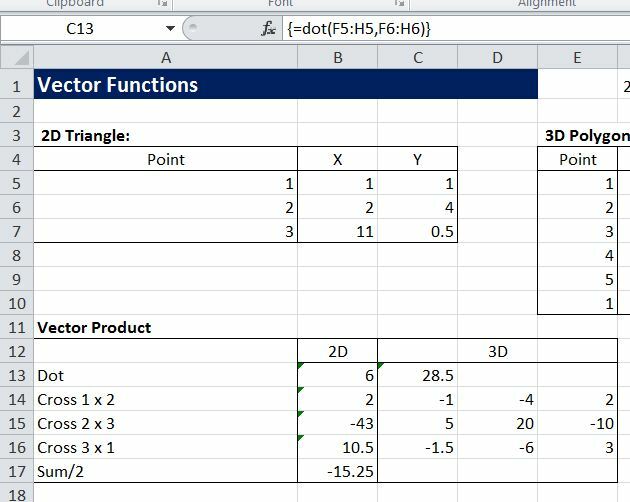 Note that if these functions are to be used direct from the spreadsheet they must be called through the Dot or Cross functions, which will peform the necessary conversion of the spreadsheet range into a 1D array of doubles. Length(Vect1, Vect2) returns the length of a vector from the origin if only Vect1 is specified, or the length between Vect1 and Vect2 if both are specified. isLeft(P1, P2, P3) tests if P3 is left or Right of the line through P1 and P2. The magnitude of the return value is also twice the area of the triangle specified by P1, P2, P3. Note that isLeft cannot be called as a UDF. Orientation2D_Triangle(P1, P2, P3) calls isLeft, and returns the same value. It may be called as a UDF. 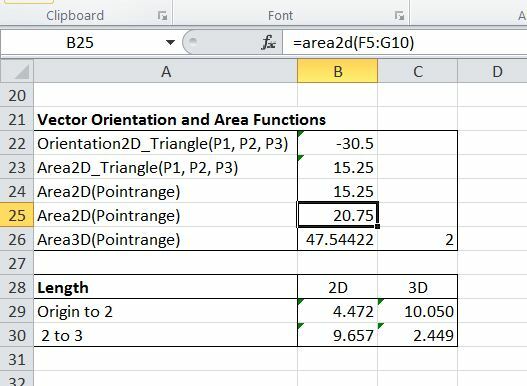 Area2D_Triangle(P1, P2, P3) calls Orientation2D_Triangle, and divides the result by -2, returning the area of the triangle P1P2P3, with a positive area when the points are specified in a clockwise direction. Area2D(Pointrange) returns the area of a 2D polygon with any number of points. The points are assumed to be arranged in a range of n rows x 2 columns (X and Y values), with the last point being the same as the first. Area3D(Pointrange) returns the area of a 3D polygon in a plane with any number of points. The points are assumed to be arranged in a range of n rows x 3 columns (X, Y and Z values), with the last point being the same as the first. If the points are not on a common plane it will return the area of the polygon projected onto the plane defined by the first three points. Examples of the use of these functions are shown in the screenshots below. Download VectorFunc.xlsb for more details and open source code. This entry was posted in Arrays, Coordinate Geometry, Excel, Maths, Newton, UDFs, VBA and tagged cross product, dot product, Excel, UDF, VBA, vector area, vectors. Bookmark the permalink. any chance of an example with unitnorm? which includes the “UnitNorm” code inside their area3D_Polygon code, but they don’t have a function called UnitNorm. It looks like I have extracted the UnitNorm function from their code myself, and looking at it now I don’t think “UnitNorm” is the right name, since the length of the vector it returns is not 1. It looks like the function returns a vector that is normal to a plane defined by the 3D coordinates in “pointrange”, but I’ll look into it further, and if necessary correct the terminology and post an example. Can you check the link to the spreadsheet? The zip file does not contain a spreadsheet. If you download that and unzip it it should work as long as your Excel will read 2007 version files. Cross products apply to 3×3 matrices. The off-diagonal elements of an adjoint matrix are cross products. An adjoint matrix equals the product of the inverse matrix (minverse) and the determinant (mdeterm). Should work. Can you give us more detail about what you are suggesting.